Your Mt. Hoodiest run? Hood to Coast on Aug 26 and 26. OBSTACLE—Slide, bounce, and slog your way through the mud pits of Lee Farms, where the first beer is free and hot showers cost extra. RUN—Half Marathon, 5K, 8K, 15K. Live music throughout the course spurs runners to the finish line, where the Widmer Brothers Beergarden serves up complimentary bowls of Irish potato soup and pours aplenty. RUN—Celebrating the only state-sponsored rock festival in US history (Estacada’s 1970 Vortex I), unbury the cutoffs and brush out the wigs as you traverse the sometimes-challenging terrain of Milo McIver State Park. RUN—Walk or run 3, 7, or 10 miles through Downtown Vancouver in support of Clark County charities, culminating in an after-party featuring Deschutes beer, Franz Bakery breadsticks, and java courtesy of Boomerang Coffee Shop. Your tweediest ride? Portland Tweed Ride on April 9. RUN—Mimosas and massages wait at the finish line of this race through downtown. Proceeds benefit local nonprofit Albertina Kerr’s efforts to empower Oregonians with developmental disabilities. 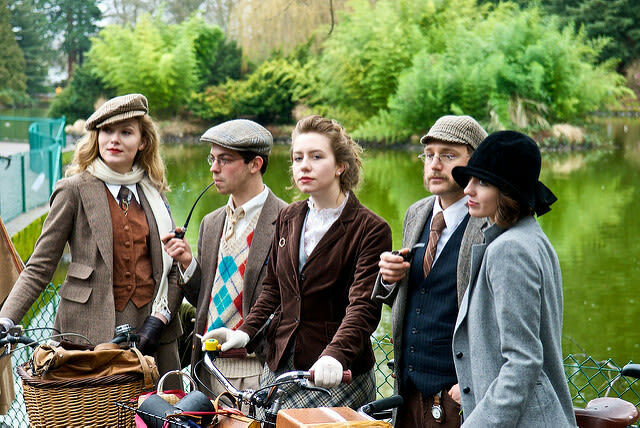 BIKE—Join ladies and gents garbed in Harris Tweed for a leisurely 10-mile romp through Southeast, ending with a picnic celebration rich in snacks and libations. RUN/RELAY—This flat course takes you through the new-blooming tulip and lilac fields of Woodland Bottoms farm country, complimented by breathtaking views of the Columbia and Lewis rivers. RUN—10K, 8K, and Kid’s half-miler. Race across Fremont Bridge and close the day with live music and local libations. RUN—A 50K or 50-miler through the mountainous region of Tillamook Forest, where vistas of ghost snags and charred trunks are complimented by staggering waterfalls and long trail descents. RUN—Drink your way across some of Portland’s best bridges with two complimentary cocktails (courtesy Lagunitas Brewing and Two Town Cider), live music on-course, and a post-race party. BIKE—Choose your starting point—Portland (104 miles), Newberg (80 miles), Amity (55 miles), or Grand Ronde (26 miles)—and ride through two lunch stops to a magnificent beach party with a hearty feast at the finish line. Proceeds benefit lung cancer efforts. RUN—Short, sweet, and outta this world. Prizes are awarded to the best alien-impersonators in this 5K-Kids’ Run mashup. RUN—10K or 5K. Proceeds support recovery programs for those who have experienced domestic violence or abuse. RUN—This race offers three distances—5K/10K/half marathon—with all participants receiving a T-shirt and medal. (All runners receive complimentary lunch from Buoy Beer Company.) All proceeds fund scholarships for low-income families and individuals to access recreation programs. BIKE—The mass-start event—choose a 71- or 117-mile route (Gran Route or Medio)—is styled after such professional grand tours as the Tour de France and Giro d’Italia, with pleasure riders tooling alongside—okay, behind—elite racers and former pro athletes. Your glowstickiest run? The Starlight Run on June 3. 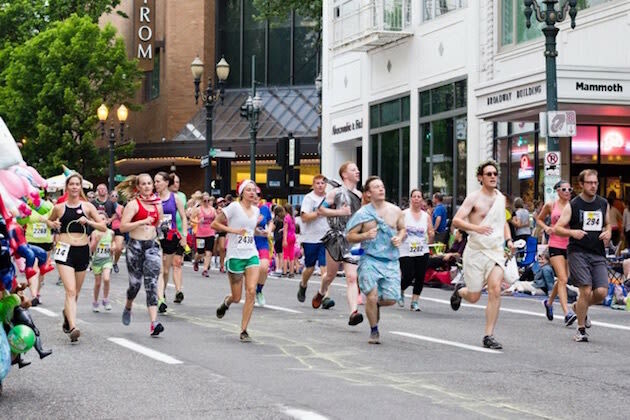 RUN—Portland’s biggest party in the streets, this late-night race winds through downtown amidst a cheering crowd of spectators. Perks include free glow sticks, costume contests, and a finish-line DJ dance party. RUN—Complete one or two loops around Timothy Lake at 3,000 feet in the high Cascades with views of Mt. Hood. 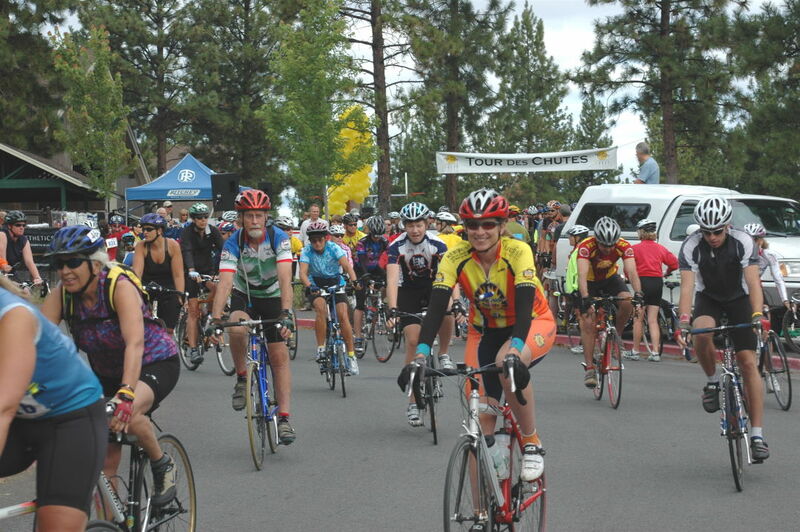 BIKE—Celebrating ladies on bikes, this all-women ride traverses Oregon wine country. Cheers! RELAY RUN—This 65-mile, 12-leg running event has your team crossing 12 historical bridges and scaling the full length of the Banks-Vernonia State Trail. RUN—Race through the vineyards and trails of the Stoller Family Estates Vineyard. 5K run, 1K wine tasting walk. BIKE—Yes, this popular annual quadrant-roving bike parade is free, but consider bringing a Tubman or two for donation collectors. The ride originated as a “protest against society’s dependency on oil,” and that continues today, with a focus on cycling as a sustainable form of transportation. And also, people are naked. BIKE—Cycle 30, 50, 70 or 100 miles through Willamette Valley wine country during high bloom, ending with a gourmet dinner complete with live music, hand-carved tri-tip, iced mochas, and bottomless wine. Your Deschutiest ride? Tour des Chutes on July 8. RUN—This Sauvie Island Independence Day classic is, as advertised, pretty damn flat. Distances include a full and half marathon, accompanied by 5K or 8K off-road farm course and a 1K race for the kiddos. BIKE OR RUN—This multi-event fundraiser for cancer care includes a 5k run/walk and bike rides spanning 7–100 miles of high desert. RUN—Don a cape and run, walk, or fly through this Cook Park course, featuring a hero-themed kid’s fun run and costume contest. Proceeds support the efforts of Candlighters For Children With Cancer. OBSTACLE—Complete with mud pits, slip and slides, and foam baths, this course is guaranteed to get you dirty. BIKE—This grueling century features 100 miles of singletrack and gorgeous views of remote Central Oregon wilderness. Just promise us you’ll stay hydrated. RUN— 5K run racing towards the sunset in the midst of the Tigard Festival of Balloons. Benefits the Foundation for Tigard Tualatin Schools. RUN—Try not to die of dysentery at this nostalgic event based on the classic Oregon Trail computer game. Along the way, runners must choose whether to go hunting, ford a river, and other 19th-century quandaries. RUN—Take on rugged mountain slopes and altitude of up to 7,850 feet as you circle Oregon’s majestic national park for 6.7, 13, or 26.2 miles. (KIDS) OBSTACLE—Set in the mud-tastic wooded trails of Rooster Rock State Park, kids ages 5-16 can army crawl across wet terrain, scale cargo nets, and rope swing into mud pits. Parents race free. RUN—Test your altitude training on one of the best mountain runs in the country. This 7-mile race starts and finishes 6,000 feet above sea level at historic Timberline Lodge, with a high point of nearly 7,000 feet at Palmer Chair. RUN—Organizers describe the state’s newest ultra as a “brutiful” route along the scenic North Umpqua River Trail in Umpqua National Forest. You’ll experience 800-year-old trees, waterfalls, and lakes—and sooo many miles of brutalizing singletrack. BIKE—45, 60, 85, 100: no matter the mileage, Portland Century organizer promise spectacular routes and oodles of good food before and after. Portland State University is base camp for this 10th anniversary urban-to-forest bicycle tour. RELAY—This famous relay features 1,050 teams of 12 (that’s 12,600 runners!) on a nearly 200-mile trek from Mt Hood’s Timberline Lodge to the beautiful Oregon coast.